Robert Frost got it, man. He understood how fleeting life’s pleasures—nay, life itself—can be. As Takeout editor-in-chief Kevin Pang wrote about our the top-ranked item on our list of America’s greatest fast foods, “When you see your order travel from fryalator to hot tray to cardboard sleeve to paper bag in one almost-continuous motion, you have witnessed the platonic ideal of fries-dom.” Yet experience tells us that the window for that platonic ideal is a small one. Those first few fries are perfection (nearly always). But sometime between those exquisite bites and the moment the mostly-empty bag hits the trash can/passenger seat floor, those returns sharply diminish this. They’re great, then they’re good, then they’re mostly edible, then they’re cast aside. 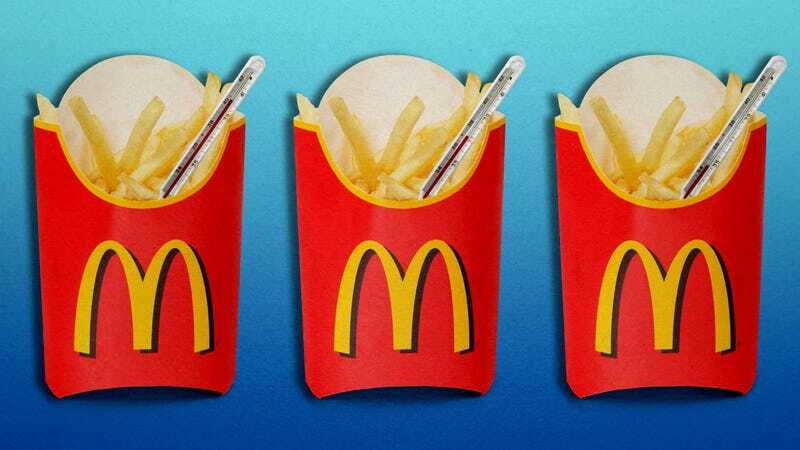 So: What is the half-life of a McDonald’s French fry? When does it expire? What are the precise stages of that diminution in deliciousness? At what point does solid gold become fool’s gold? We at The Takeout were determined to find out. ˙ He probably was not. Frost died after both the founding and franchising of McDonald’s, so it’s not not what he meant. Ours is a small sample size, to be sure, but the results seem, to our eyes, conclusive. Three different locations, three different times, three different people, very similar results: McDonald’s french fries become notably less appealing at around the 10-minute mark, and are a big old nope by minute 18. First, our methodology. Takeout staffers Kevin Pang, Kate Bernot, and yours truly each went to a separate McDonald’s last week. On arriving, we each positioned ourselves near the checkout counter, in view of the fryolator, and waited for a fresh batch to hit the heat-lamps. As soon as it did, we each hit start on our stopwatch and asked for an order of fries—Kate and I each also ordered a beverage, so that we’d have something to do between bites. On receiving our fries (in a bag as well as a sleeve), we proceeded to a table. Bags were left open but fries were not removed from the bag. The ambient temperature of the room was taken, and then we ate a fry (or fries) once per minute until they were no longer palatable. We did not share data until after leaving the restaurant. These are our findings—nay, our fryndings. Obviously, monolith corporations often demand uniformity down to the ounce, second, or millimeter—I used to work in an Apple Store, I’ve lived it—but this was surprising all the same: The ambient temperature at each of three locations we visited was within one degree of the others. Kate paid a visit to the Brooks St. McDonald’s in Missoula, Montana at 12 p.m. M.S.T. on Thursday, January 31. Kevin visited the Dempster Street location in Skokie, Illinois at 4:45 p.m. on Saturday, February 2. And this writer trudged a few blocks on that same Saturday to reach the McDonald’s at Clark St. and Pratt Blvd. in Chicago at 3:30 p.m. None of us sat immediately next to a window. The temperature at the Missoula location was 72 degrees Fahrenheit; the two Illinois locations were within a tenth of a degree (Skokie: 71.2 degrees, Chicago: 71.3 degrees). For this writer, at least, that temperature fluctuated very little, occasionally nudging up or down a tenth but returning to the original temperature. My notes are somewhat less flowery, consisting mostly of an all-caps “YUM” or two, but I also used a stopwatch and marked a lap at any noticeable decrease in quality. My first “lap” was at five minutes. That’s also the point at which Kevin switched over to a subdued, “Quite good,” followed by a mere “Good” at six minutes. Those fries are still good, but a fry still in the bag after five minutes won’t be the McDonald’s of lore. So, they feel weird, mouth-wise—the point at which (per Kevin’s detailed tracking) they’ve dropped 60 degrees in temperature. They still, for lack of a better term, have warm-taste, but the structural integrity has begun to fail. As many novelty birthday cards for people turning 40 have said, it’s all downhill from here. The small sample size for this “study” aside, the biggest unknown here is surely that taste is a personal experience. As such, we each had our own limits. The first to bail was Kate, who at minute 13, described her fries as “cold, somewhat mealy, and heavy.” At that point, she no longer had any desire to eat the gold standard of American fast foods. You know when you forgot to do laundry, and you’ve got a pair of jeans you’ve form a couple times, and they’re fine, not visibly gross or notably smelly, but they just feel kinda bad? That’s what these fries are like past minute 13. They’ll do, if absolutely necessary. Kate got out while the getting was good. Our final two participants bailed within a minute of each other, at 17 minutes (Allison) and 18 minutes (Kevin). At this point, the fries are lukewarm at best, no longer crisp, mealy bordering on gummy, and generally unpleasant to eat. They even seemed to lose some color. First, speed is key here. We are not advocating that you shovel french fries in your mouth like Liz Lemon in that episode of 30 Rock where she has to eat her teamster’s sandwich before going through airport security, but time is not your friend. Whatever else you have on your plate can wait—get the fries in before the five minute mark if possible, and the 10 minute mark if necessary. Once they register below 100 degrees Fahrenheit, it’s every fry for themselves. Second, if you have the ability to wait for a fresh batch, do. You’re missing out on some of the best fry-eating time otherwise. Third, preserve heat at all costs. If you had your bag sealed, you could probably buy yourself a few minutes, but you’d have to resist opening it (and thus potentially missing out on the golden five) by until you reached the place you were going to eat. Closing the bag between bites could help, too, but that’s kind of weird. Speaking of weird, sitting in a McDonald’s with a soda, an order of fries, a cooking thermometer, a notepad, and the stopwatch app open on your phone is a great way to make people look at you funny. Our final frynding (can’t stop won’t stop) deserves its own bracket, and will also make you look like a weirdo. This won’t work if you’re driving-thru and/or in a hurry, but if you’ve got a hankering for the majesty of McD’s, our suggestion is to order a small (or a medium, if you’re sharing,) eat those, then go back and order another, assuming you still want more. The heat lamps don’t totally make up for the heat of the fryer, but even if your second batch (or hell, your first batch) isn’t fresh, it’ll still be better than a fresh batch that’s been sitting on a tray for 11 minutes. Seriously, we earnestly advocate this strategy. It requires some extra work, extra time, and some extra money (though this may vary by location), but the decrease in quality is so marked that we have to suggest anyone looking to eat more than a small fry acquires said fries in batches. Robert Frost was right—nothing gold can stay. When eating McDonald’s fries, do not dilly-dally. And also don’t time yourself. I freaked some people out.